When I began on this journey, I had no idea how much it would change the way I am. It truly has. 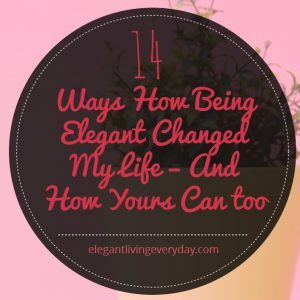 Being elegant changed my life, and for the better! There are a few things I have realized that living an elegant life really has transformed me and my life. I want to share them with you in hopes that maybe you can agree with me. 1. I feel like it started to change the way I perceived people in my life. I didn’t take anybody for granted anymore. Everyone has something to offer. Even a little child who so badly wants to carry on an adult conversation has something to teach you. It could be to be patient, it could be to be more understanding, but whatever it is, it is something for you to learn from. There are many times in my day (especially if you work with the public) that you just start to get frustrated with people. That you don’t want to see or talk to another person for the rest of the day. This happened to me quite often before, and I am not going to lie, it still happens now. However, I have to think to myself, “What can I learn from this person?” Everyone has something to offer to someone else. It is up you whether or not you want to see it. 2. I started to slow down. I saw things that I used to not notice before. I wanted to experience things more passionately and fully, so in order to do so, I had to slow down. This made me aware of things I was missing out. One example is when I was driving the other day, some person clearly in a rush cut me off and decided to speed. As that was happening I noticed the most beautiful pink sky at the horizon that if I was rushing I would have completely missed the beautiful surrounding. When you slow down you will notice and appreciate the little things that once before are taken for granted. Another good example is people who live near mountains, or in other beautiful countries. For the tourists, it is something to be admired to take pictures and to be remembered. But for the people that live there, it is simply just another day, and nothing to think twice about. 3) I became more aware of my body, its movements. When I started adopting my elegant lifestyle and slowed down I also tried to be more deliberate about my movements. I didn’t want to be swinging around or not be in control of my own limbs. I didn’t want to be labeled as a spaz. So in order to remain as elegant as possible I decided to pay more attention to my actions. When I got up, I did so using my muscles in my torso and legs. I didn’t just bounce up out of my seat with my arms just swinging behind me. What ever I did, I did so mindfully, that way to prevent any sort of image of me not being in control. This also span into other parts of my life, a big one for me was getting in and out of my car. It is so easy to just plop down on your car seat. But instead try doing it the lady like way. By being gentle, deliberate, and by slowly doing one move at a time. This takes practice, but once you get the hang of it, it becomes second nature and the next thing you know, you’re in control of your body and not flailing around. This one I found took more time to adapt to. Since becoming elegant, I knew that my late night binge eating of fast food is over. Not because I was no longer allowed to eat junk. No. But because I cared too much about the way I feel. I hated feeling like I was hung over the next day when all I did was have a burger or two. When you start feeling great, the last thing you want to do is feel disgusting again. So you start eating more healthy and it doesn’t seem like a chore. You naturally just want to. This also means that because you respect your body more, you also don’t want to subject it to anything that could possibly dumb you down. Your entertainment might change from watching reality television to possibly some national geographic or something to learn from. You aren’t changing what you are watching because you WANT TO BE elegant. No, you change what you are watching and what you find entertaining because you ARE elegant. You just start to find what you used to like off-putting and not be interested in it any more. You slowly become more refined. 5) I made an effort to anticipate elegance. When you start to become more elegant, it starts to rub off on to other parts of your life. You don’t want something to misrepresent you. Therefore, you won’t have your house a complete chaos. You think in the back of your head, “How would you feel if someone you knew saw your house/your outfit/your car that way?” Would you be proud of it? These are important questions because when you are anticipating elegance, you are able to let go of other worries and be more present and engaged with the people you are with. Anticipating elegance is a great way to feel ready for anything. It can bring you so much confidence that other people recognize it and admire it about you. Ways you can anticipate elegance is by leaving the room the same way you entered. Before you leave the house, you make sure that everything you are wearing is exactly what you want and that you are happy with it. The list goes on and on but I think you get my drift. By anticipating elegance, you are getting yourself ready for the unexpected. You are understanding that anything can happen and anyone can just drop in and by trying to be ready for it, you appear for elegant and put together. 6) I started to care more about how I was perceived to others. This is not to be confused with caring too much about what others think about you. No, but it isn’t too far away from it either. You want others to think very good of you, That you are kind and would give the shirt off your back. By achieving this, you actually have to do it. You must start to be generous and kind and be patient when it is called for. Perception is reality and how people look at you is exactly how people will know you. So if you think, no I am elegant and because I say I am and act like it, well than others will think I am. But it is not how you explain it or tell people. It is when you don’t speak that has the most influence. It is when others are in need and how you come to their aid. It is the small gestures that people will always remember. 7) I try to keep my emotions in check…don’t give other people the power to control my emotions. Another way of having control over your body is to not allow someone to have the power over you to make you said or happy or feel anything that you aren’t ready for. By not allowing someone to do this than you again have control over your feelings. You can’t get hurt by someone who doesn’t control your feelings. You can’t feel happy or sad for anybody else but yourself. It’s very hard to remain elegant when you are flying off the handle. And this is something that I struggle with often. But with persistence, I am only getting better. Soon, hopefully it will be a thing of the past! 8) I took care of things I owned, no matter how expensive they were. Becoming elegant has made me appreciate everything that I do have. Whether or not they are worth anything, but to me, because they are my belongings, I will treat them as such. A great example is sunglasses. Before I would always either lose them, sit on them, scratch them, drop them, really anything can happen to them. But after I started on my journey, I now take care of them. I cherish them as mine and because of that I take great care. I only clean them with the appropriate cloth. I keep them in their case. I also don’t just leave them laying around. This is a result because I started to live elegantly. I would think, if they were more expensive sunglasses, would I treat them as such? So why is it okay to treat them like they are worthless? Suffice it to say, after my journey I now have purchased a very good quality pair because I have shown to myself that I can do it. I can take care of anything of mine, regardless of price. Because I look at the worth. I appreciate everything I have and I realized how hard I had to work to get everything of mine. Because I now have a better understanding, I will respect everything of mine, even dollar store items, because frankly, it isn’t how much it costs. 9) I cared about others and their feelings, which in turn had more people caring about me. Since I take into consideration what others would feel either about a situation or someone I care about how they feel. I don’t make assumptions or think that this is how someone should be. 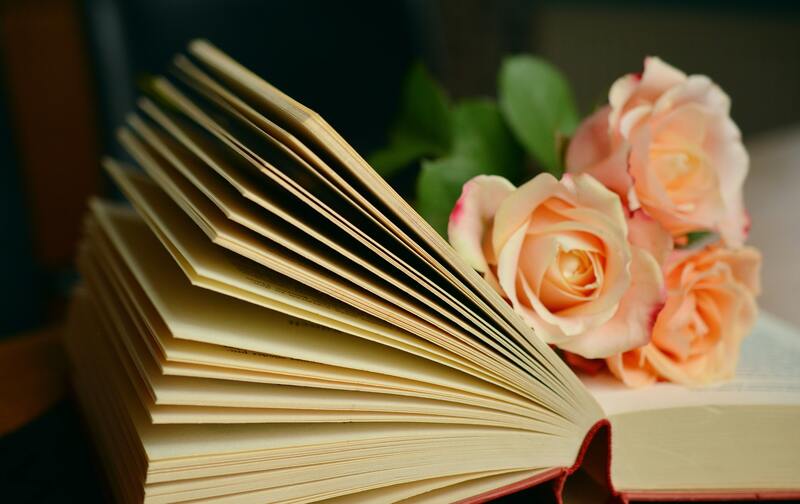 Instead I take a more understanding and compassionate route and because people notice that I am not forcing them into a thought, they start to respect me and my ideas. People will start to ask me genuinely about things bothering them or other personal matters and I will give them straight up true answers. But instead of people shrugging it off, they take validity with it and think they can learn something. 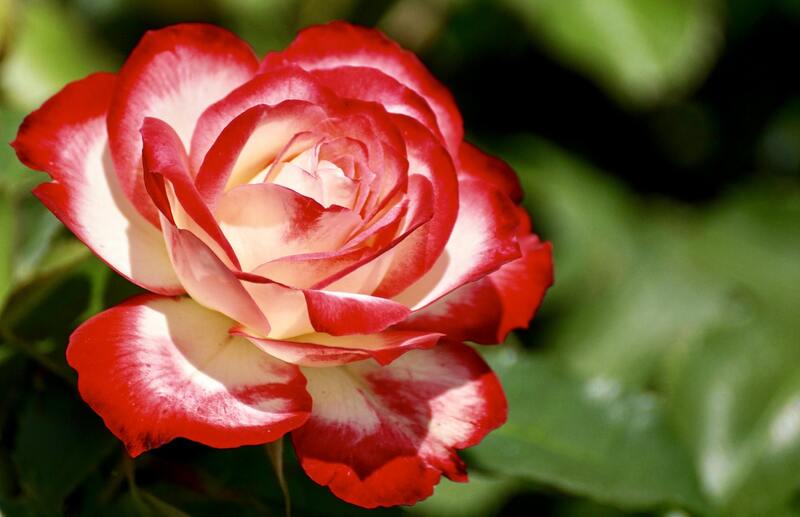 It’s nice to care for people, but it is nicer to know that people equally care for you as well. It’s the same as it’s great to be in love, BUT to be loved is another better feeling. 10) I wanted to keep bettering myself. This could mean so many different ways. There is more learning, more money being earned, more life living. It can wrap it all up together and it depends on who you are. But the main story here is that no matter who you are, there is always room for improvement. There is always a way to find different methods to better yourself. You must find what interests you and how you can improve on it. You’ve always wanted to learn another language, well this is the perfect time to. You want to stay current with everything happening in your city or country. Fine with me. This is a spectacular way that living elegantly has changed my life, you really are never too old to keep learning. And the moment you stop learning is the moment you are dead. So, think of everyday as an opportunity to be smarter than you were yesterday. 11) I had a sense of self-confidence that I never thought I had before. After becoming elegant I have become more confident even with strangers. This is not to be confused with cocky or arrogance. This is strictly that once you have developed some elegance you become confident in what you are doing. Who you are meeting and when you look at them you are not ashamed of who you are or where you work. The confidence is very obvious and everyone can see it. It I always see how people on social media look like they are living the high life but in reality they are anyone else. It is a very attractive and gravitating personality trait to have. 12) I allowed myself to sound smarter instead of lower my standards. I didn’t let myself sound stupid for the sake of keeping someone else interested in what I had to say. This one is an obvious one. Don’t think that in order to attract more people in a conversation is to act like you don’t know. I am not quite sure where that became popular and acceptable but it isn’t. There is nothing sexier than someone who can have an intellectual conversation rather than wasting time talking about celebrities and the crazy names they are coming up with for their children. Don’t feel that you need to dumb yourself down to fit in. By not doing so might help others feel that they shouldn’t either. But at the same time don’t put people down if they don’t understand what you are saying. 13) I started choosing quality over quantity. This another obvious one but is needed to be mentioned. This can be related to so many different aspects of your life. Even when it comes to your time spent. You understand your life is short and want it to be the best it can. In regard to every aspect in life, choose quality because it always wins out in the end. 14) I started realizing what was really important to me. By choosing quality over quantity, you start noticing how you spend most of your time. This is helpful when you want to learn more about yourself. You start seeing that you spend a lot of time with your siblings and your other family. You would rather be doing something along those lines, like having a great experience than just sitting alone in your house. It’s a great feeling that once you understand yourself more that you start seeing what is really important to you, and this usually involves family and vacation but maybe it could also be that morning walk or your evening bath. Fill your day with everything you enjoy. This will bring you happiness and fulfillment. 15) Bonus: All the mundane and boring chores, now become something you look forward to. Since you find the happiness in the smallest of all things, you have trained your mind to find pure bliss from something so unlikely. This is a skill that can be honed and is very likely to be one of the best as you age. There is always someone who changes you. Somewhere in your life that makes you realize what you want to be like. I would call this a very pivotal moment and you can’t ignore it. I am sure there isn’t just one moment in life, but there are many and you need to be aware of them so that you can make the best of it. Anything I am saying here, anyone can achieve. This is why living elegantly is so wonderful because everyone has the option to bettering themselves. It also means that everyone had a chance to live their life to the fullest, what ever that may mean for them. It is very personal and yet only you know the true answer. So look inside yourself and see what you can change or improve on to become the most elegant woman you know. No matter who you are you really never got there alone. There was always someone there that was influencing you and I want you to be that for someone else. I want you to influence someone that makes them feel that they should be more elegant. Make the change over to living an elegant life and see how it changes you for the better. It is remarkable how much joy of life. Try it today. Let me know how it feels. Has any one of you ladies ever changed your life to living more elegant and seen any changes? Do you have anything to add? Written by Jennifer Lynn. You can find her on her personal blog, Elegant Living Everyday, on Twitter and Instagram. Love this Jennifer! 12-14 especially resonated with me. I didn’t realise until I read that just how often I choose to speak differently around certain groups of people and I really shouldn’t! I am so glad that you enjoyed this! I feel like after I seriously started to live elegantly that is when I stopped trying to dumb myself down. I really didn’t like it because it was like I was changing my standards, exactly what you are saying!